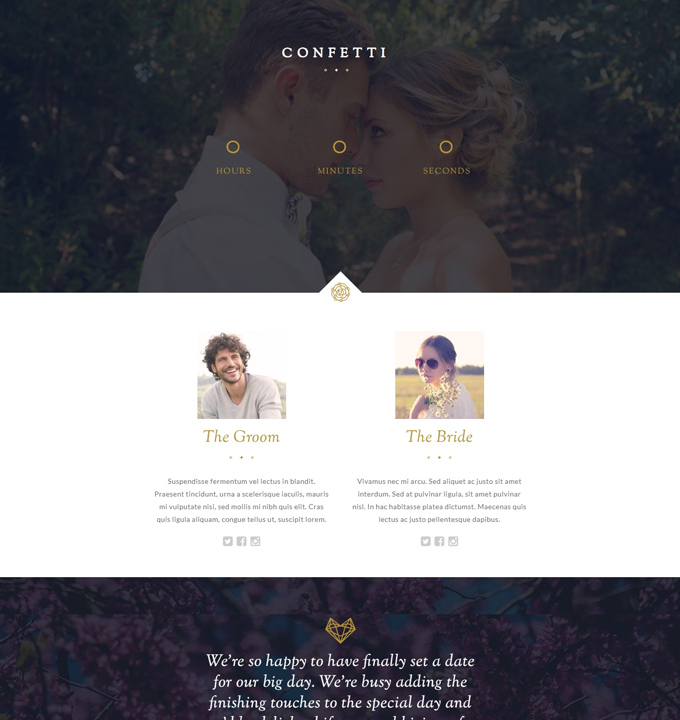 20 Gorgeous Premium WordPress Wedding Theme For Your Special Day! When it comes to managing any events, there are tons and tons of things to take care of making sure that it goes according to the plan. Not to mention all of the planning and management and even reservation that needs to be taken care of. While we have talked about all this and also listed out the best free WordPress wedding themes on our previous blog posts, today we wanted to take it a step further and present you the list of the best Premium WordPress Wedding Themes. But with the options of free out there, you might be wondering why pay the extra amount and get a premium theme for you? 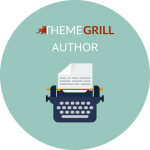 Well, starting off, premium themes come with a whole lot of features that you might find useful compared to the free ones. In addition to the features, premium themes are more likely to provide more flexibility and customizing options as well. And if you are looking to go professionally and start an online platform for your business, these premium themes do much better with options for your visitors. With options for WooCommerce compatibility and more advanced typography and colour options, these are likely to be more appealing to the viewers. But that’s the least of what the themes we have listed below offer because simply put, there are more than we can possibly think of when compared to their free counterparts. Not only are these suitable for professional use, but we have also enlisted the ones that can be used for personal blogs, portfolios, photography sites and more. Best Premium WordPress Wedding Themes For 2019! Flash Pro is an amazingly flexible and multipurpose WordPress theme. By this, we mean that this theme is capable of features that make it ideal for almost every niche of websites including the wedding niche as well. It comes with tons of amazing pre-built demo pages that you can easily make use of. The layout structure is built with attention to details and ensures a great performance. Apart from the fact that it is completely responsive and retina-ready, it is also highly customizable. To make things easier, it also includes the Flash toolkit plugins that further enhances the features included. Drag and Drop Page Builder included. Custom widget area builder with over 6 pre-built sections. Post Slider and Progress bar options. Soulmate is a fantastic option for those looking for a professionally designed premium WordPress wedding theme. A hassle-free and easily customizable theme ideal for any type of event and matrimonial website, this theme is responsive and retina-ready. Inbuilt with a lead generation that helps you promote your business online, it is sure to make your site stand out. You can include the tap-to-call feature to make your site more efficient. Additionally, it also features options for calendars, video support, media files and even section for the blog. What’s more is that you can add an eye-catching image slider on the Home Page to add an appealing factor for your users. 8 colour scheme options to choose from. Individual Page templates for each category. Attractive Sliders and Video support. Multiple social media icons for easy social sharing. Built with the latest Bootstrap framework. 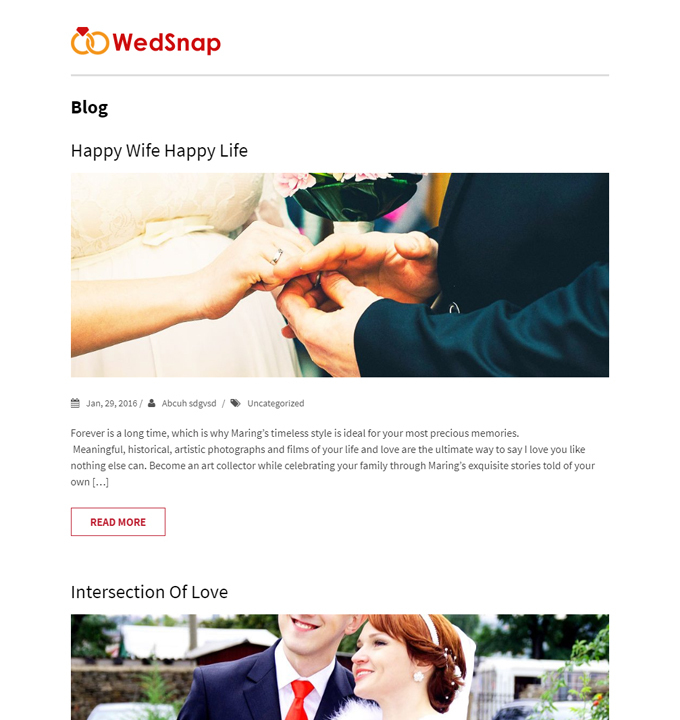 Just as the name would give out, Wedsnap is a premium WordPress wedding theme that is ideal for photography and portfolio sites. What’s great is that the flexible structure can also be used for professional and business purposes. The layout is gorgeously created with stunning pages for galleries, blogs and more. Stylish, professional and highly customizable, it comes with a range of useful elements that makes sure that your site is engaging for the users. Easily add images customize sidebars, change logos and basically come up with your own custom website without a single coding knowledge. It also features an inbuilt contact template that you can use it to your benefit. Rich and vibrant colour schemes to choose from. Stunning Slider section to highlight your images. Unlimited number of portfolio option. 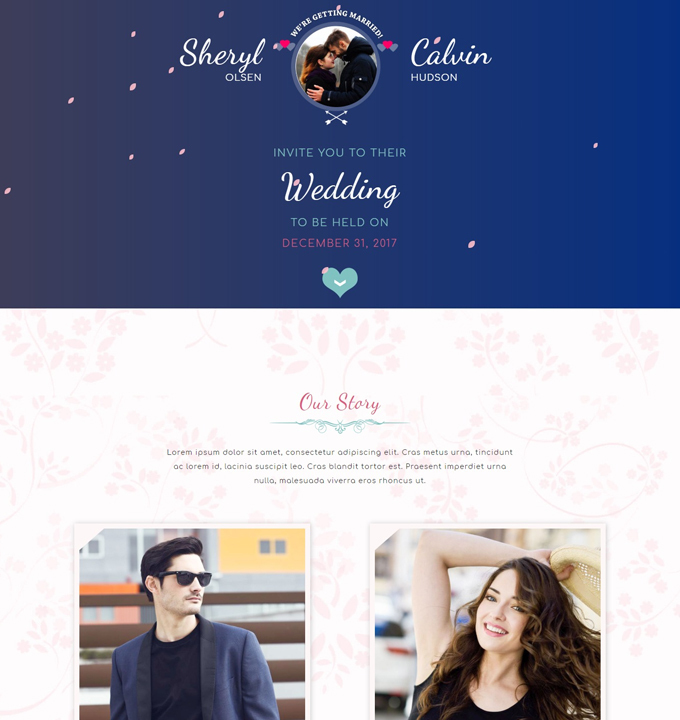 An elegant, simple and minimally designed premium WordPress wedding theme, Qaween is a magnificent choice to opt for. And we say this not only because of the amazing visuals but also because of the range of amazing features. 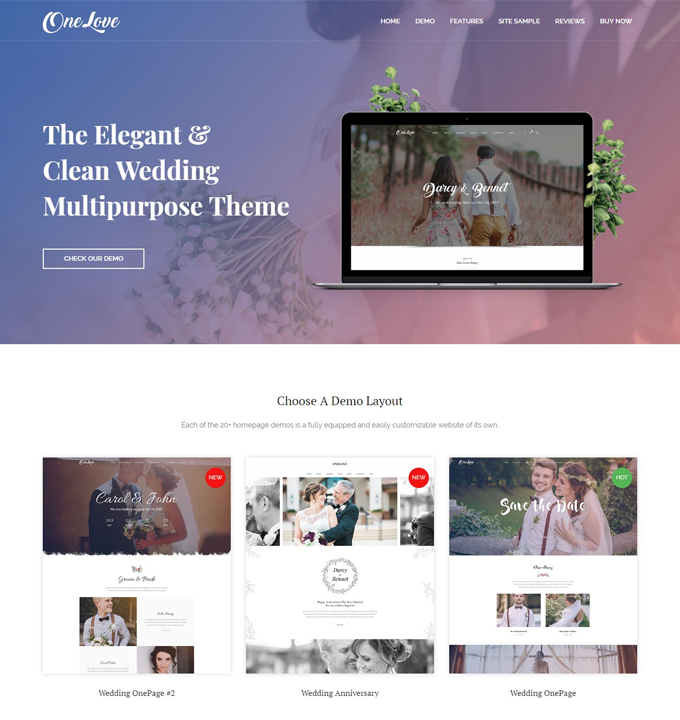 Powered by the Redux Framework, this top-notch theme is ideal for every kind of matrimonial and wedding websites whether or not it is for professional use. In addition to this, the template includes multiple Home Page designs for the users and also options for different Pages. The Visual Composer it features provides the user with an easy drag and drop feature for a user-friendly customizing experience. Get the most of what you invest with Qaween and we are sure you will never look back. Multiple Home Pages and Inner Page styles. Countdown timers and other RSVP elements. Filterable gallery and Slideshow option. Eternity is another option for those looking for a minimal yet elegant design with their wedding website theme. Built to cater to the matrimonial and wedding niche, it is ideal for personal and even professional use. It is powered by the Foundation Framework which makes the theme advanced and up to the latest standards. With tons of amazing elements and features, the design is also completely responsive and retina-ready. It features stunning animations and smooth scrolling thanks to the valid and well-commented CSS and HTML coding structure. Furthermore, it is unique and includes useful options for lightbox gallery, Google Map integration RSVP elements and more. Custom Header and Footer options. Unlimited colour schemes to choose from. Minimal and elegant design structure. 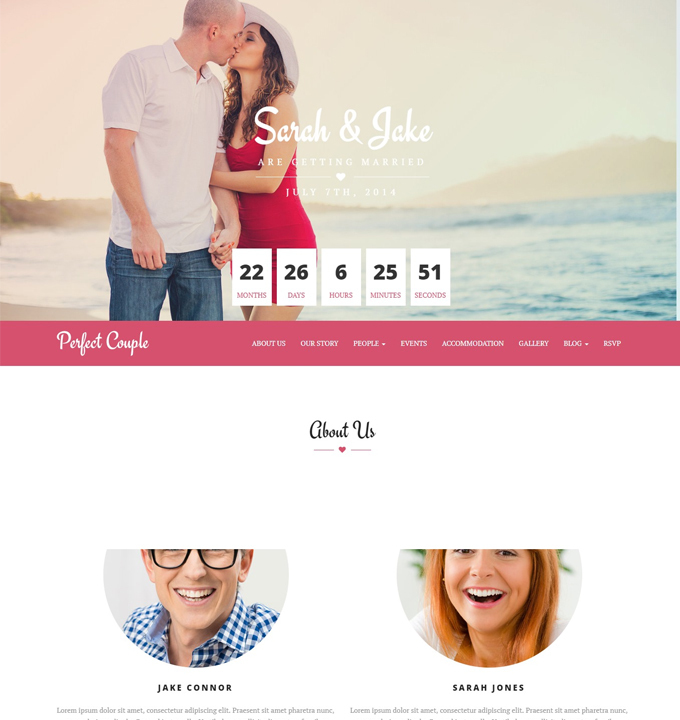 As the name would suggest, Perfect Couple is perfect for the couples in love and trying to find the ideal premium WordPress wedding theme. 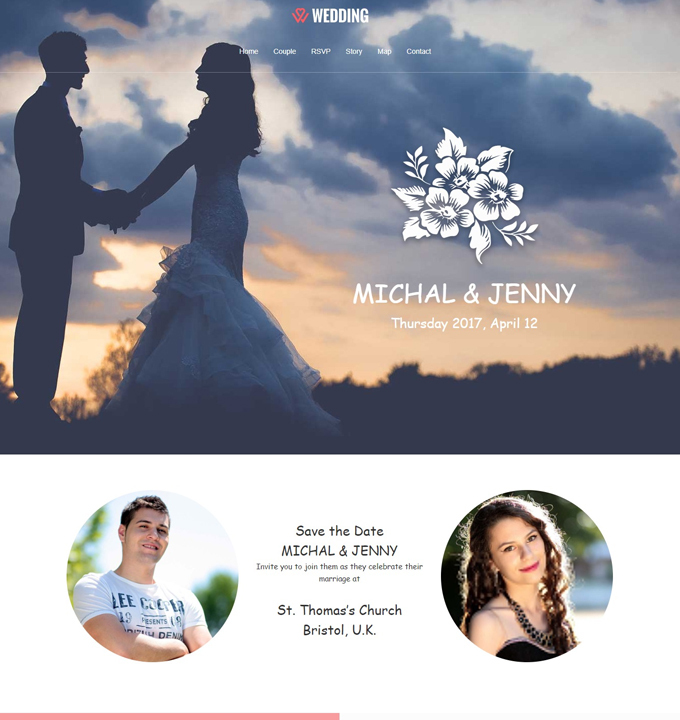 With a clean, sophisticated and stylish design, this template is responsive, retina-ready and almost everything that you might possibly require from a wedding theme. It follows a minimal design and a beautiful colour scheme and typography and font options. But as it is highly flexible and customizable, you can easily modify the elements according to your preference. It includes the intuitive Visual Composer that allows the users to easily customize the theme. The gallery or portfolio sections are simply out of this world. And it even has multiple Location Map support. Visually impressive, make your wedding more special with Perfect Couple! 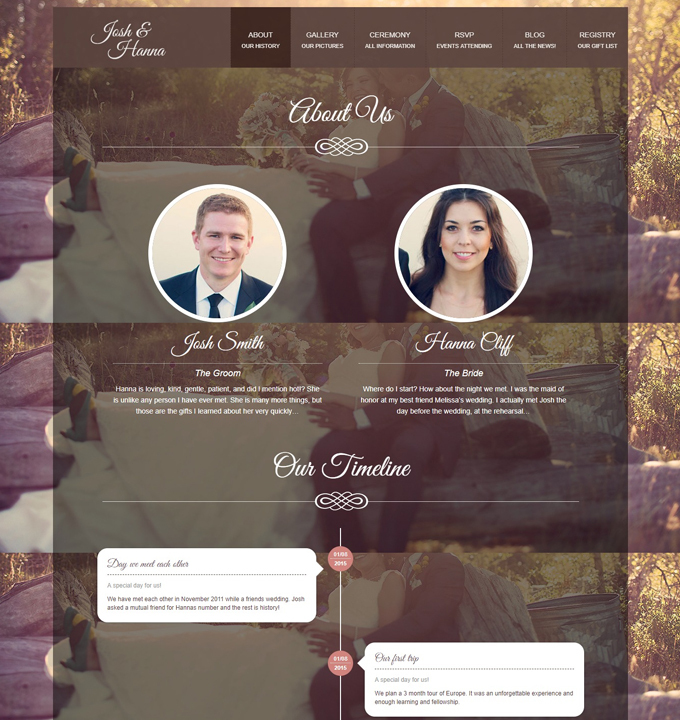 Sections for blog, bio, bridesmaids, groomsmen and more. Modern, sleek, responsive and retina-ready design. Registry and contact form included. 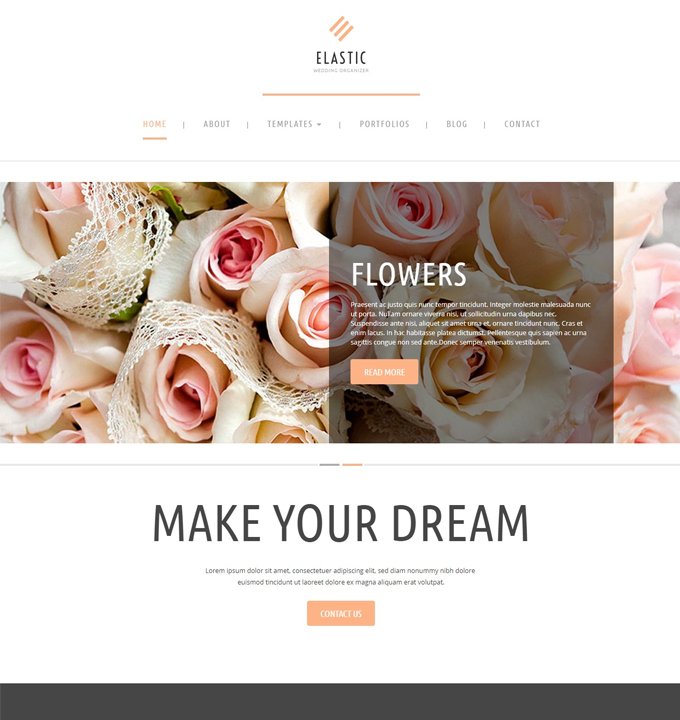 A perfect name for a versatile, multi-purpose and flexible theme, Elastic is the ideal premium WordPress wedding theme for you. Whether you are a wedding planner, event organizer, florists, or even couples looking to start their online journey, this template is fit for it all. Minimal, simplistic and chic with design, this visually enriched theme is the ideal start. It is feature-rich and comes with options for various Home Page and Inner Page designs. Additionally, it also features an excellent imagery with stunning looking galleries and portfolio sections. Share what you want with the world and get the most out of it with the useful features like RSVP, contact forms, registry and more. What’s great is that it is also completely cross-browser compatible and loads fast and easy on all the internet browsers. Portfolio, testimonials and Home Page variations. Translation and RTL language friendly. 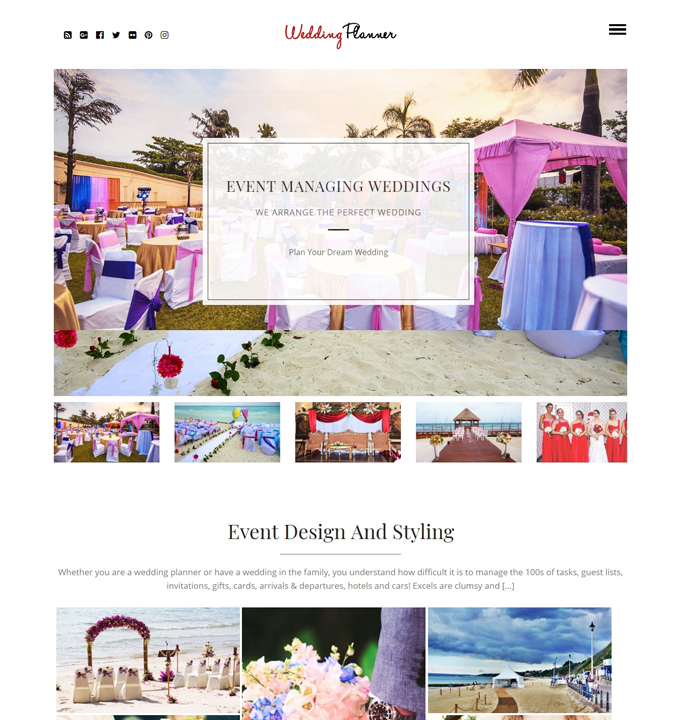 Ideal for a wedding planner, organizers, matrimonial sites and wedding venues and more, Wedding Planner is an elegant and clean premium WordPress wedding theme. It is responsive, retina ready and features excellent imagery for the users to see. The great thing about this theme is that it is highly flexible and user-friendly. This means that whether you are a professional or simply a beginner getting started, this template is ideal for all. The beautiful design is accompanied by a stunning photo blog section as well as a gallery to showcase your contents. Attractive by visuals, it is also feature-rich and effective to get your desired results. The thumbnail Slider Images provides the additional appealing factor. And to top it off, it also comes with widgetized Sidebar and Footer. Useful Page elements for blog, portfolio and contact. Blog and Gallery style variations to choose from. JPhotolio is designed and built especially with wedding photographers in mind and is a fabulous option if you are looking for a premium WordPress wedding theme. Minimal, elegant and chic design is filled with the range of features that is sure to take your site to the next level. It is responsive, retina-ready and completely cross-browser compatible. Furthermore, talking about the features, it is also RTL language and translation ready so that you have no problem reaching out to international audiences. What’s more is that you get an amazingly designed gallery section, Sliders and more that makes this the ideal choice to showcase your skills. You can even easily add your desired videos as this template comes with full support for video files as well. Full-Screen sliders with video support. Mult-level drop down menu option. 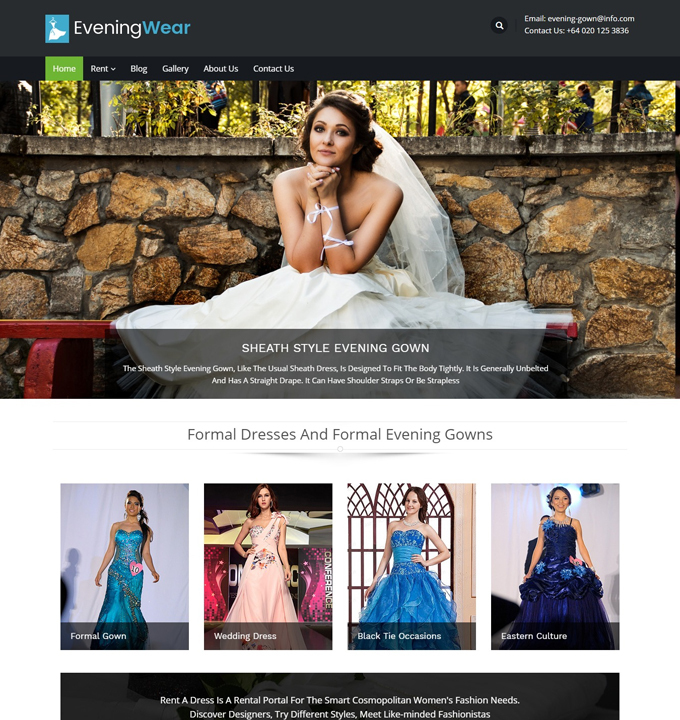 Another stunning premium WordPress wedding theme we recommend our users is Evening wear. If you own a bridal boutique and specialize in bridal wears then this is the perfect theme for your business. It is built and created with the niche in mind and comes with WooCommerce compatibility for your convenience. The design is elegant, clean and fully responsive. The images of the products you put up will be displayed in HD imagery is sure to leave a lasting impression. Even the full-width Slider option adds to the appeal so that showcasing your products is simply a piece of cake. If you want you can even start a blog and keep your viewers engaged. All-in-all a great investment, if you are looking to take your business online, Evening Wear is simply amazing, to say the least. Product Page with description option. 6 different Blog layouts and banner space. 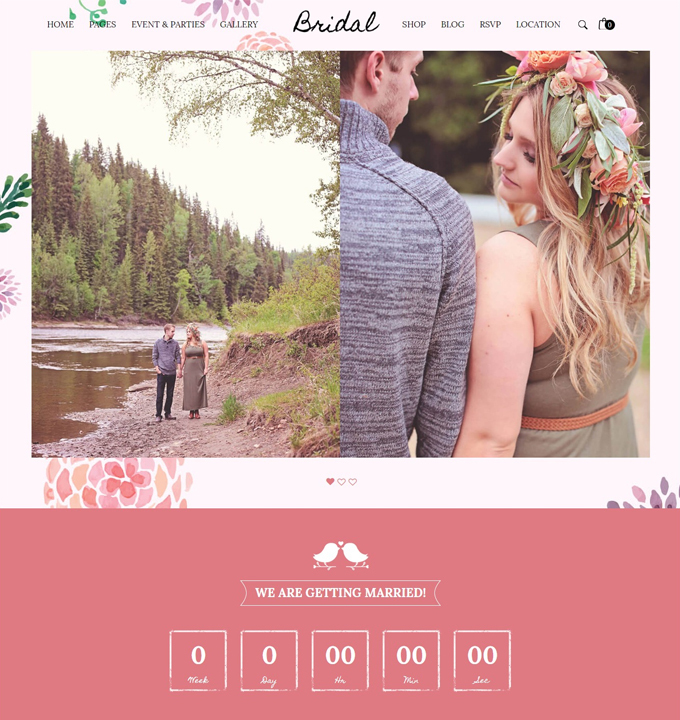 Elegant, attractive looking and visually advanced premium WordPress wedding theme, Belle Fleur is a stunning theme designed for matrimonial sites. Perfect for personal or professional use, it is highly flexible and extensible. It comes with built-in plugins that make the process of creating an effective interface a breeze. In addition to this, the Elementor Page Builder it includes provides the user with a user-friendly way to customize the theme to their preference. The layout follows a simple, minimal design which perfectly matches the wedding niche. What’s more is that this template includes additional modules with the JetElement plugins making the theme more efficient. It is cross-browser compatible and thanks to the advanced optimization, this theme is fast-loading as well. Header, Footer and Page style variations. Valid and clean HTML coding. Additional plugin for more features. Advanced typography and font option. 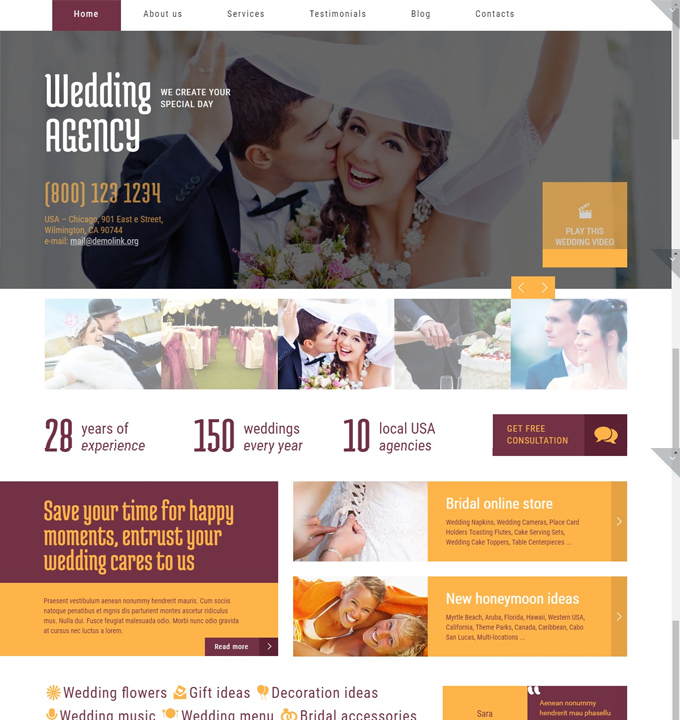 Just as the name would give away, Wedding agency is a clean, effective and premium WordPress wedding theme designed especially for wedding planners and agencies. Ideal for the niche it features a responsive and retina-ready layout structure. It is highly customizable and comes with a range of options that adds to the custom look and feel you are looking for. What’s great is that it includes over 80 different shortcodes so that you find what you need with ease. Furthermore, the stunning blog sections are also SEO friendly. For easy social sharing option, you also get creative social media icons that you can add on the site. Stunning section for blog, portfolio, sliders and more. 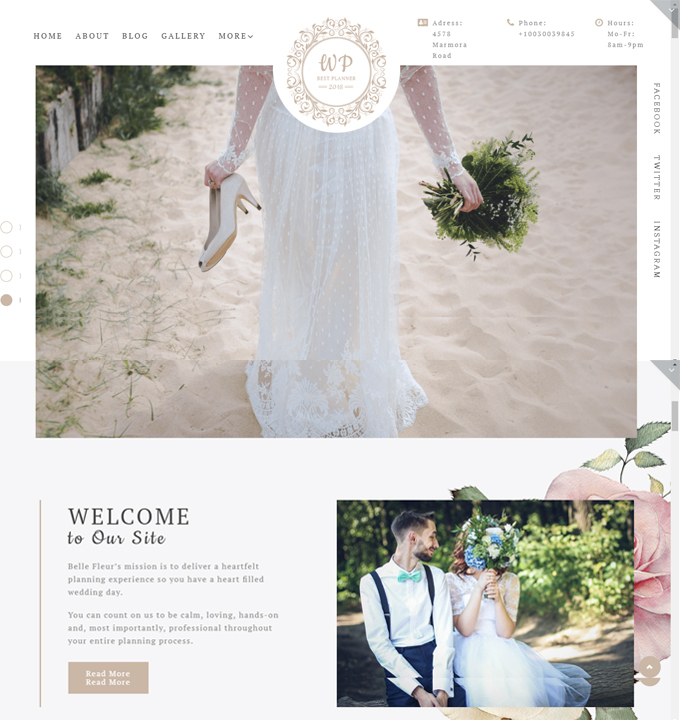 Tender is yet another fabulous option for those looking for a chic, modern and stylish premium WordPress wedding theme. Visually amazing and feature-rich, this theme is sure to make your site stand out from the crowd. And we are not the only one who thinks that. With thousands of happy customers backing up their services, this theme is definitely worth a try. It is responsive and retina ready. Additionally, it also comes with options for multilingual and RTL language compatibility. Not only this, but this amazing theme is packed with over 80 useful shortcodes that help you add whatever you need with ease. The built-in theme customizer is powerful and advanced as well. Making sure that all of your need is catered to, this template is definitely worth the mention on our list! 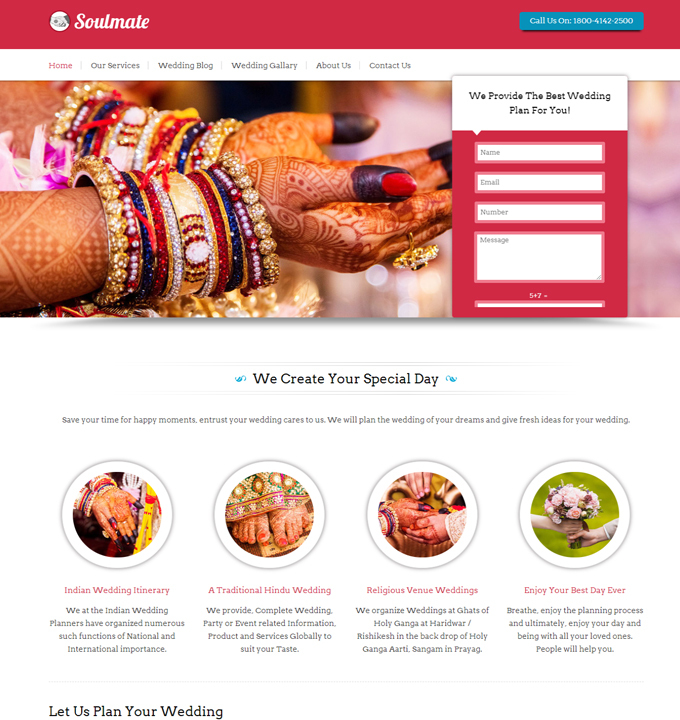 Wedding Planner by Template Monster is an elegant and responsive premium WordPress business them designed for those involved in the matrimonial business. It is ideal for wedding agencies, event planners, cake decorators, boutiques, and more. The professional looking theme is crafted with great attention to details so that none of your requirements has been left out. With the integration with Google Fonts get a stunning range of awesome looking fonts and icons that you can use. Additionally, the multiple colour scheme variations also make sure that the site ends up as per your preference. Completely flexible and extensible, you can add or remove any features that you might need. Over 80 unique shortcodes available. Multilingual and RTL language friendly. Awesome Sliders and Gallery sections. 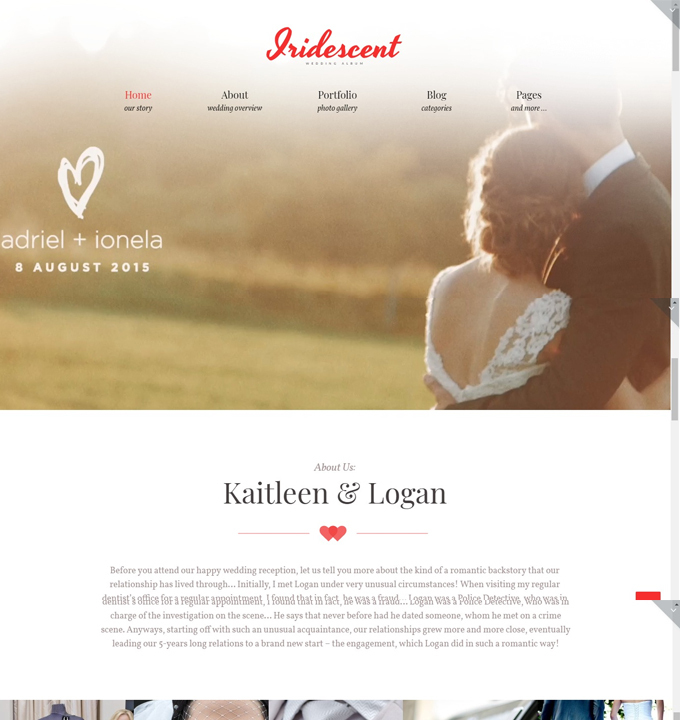 Iridescent is a beautifully designed and crafted WordPress marriage and wedding theme. The design itself is aesthetically beautiful and stunning and perfectly suits the niche. In addition to this, the Drag and Drop Page builder it features makes the process of coming up with a professional site a breeze. Get multiple layout options to choose from as well. Furthermore, you also get a large set of pre-made content modules like an accordion, blogs, maps, counters, contact forms and more. The template is completely responsive and retina-ready. Furthermore, the trademark gallery section is elegant and works perfectly to showcase your media files in an engaging manner. Not only this but the template is SEO friendly and crafted with care to take care of all your requirements. Live Customizer for easy modification. SEO friendly and optimized for speed. Stunning gallery and portfolio sections. 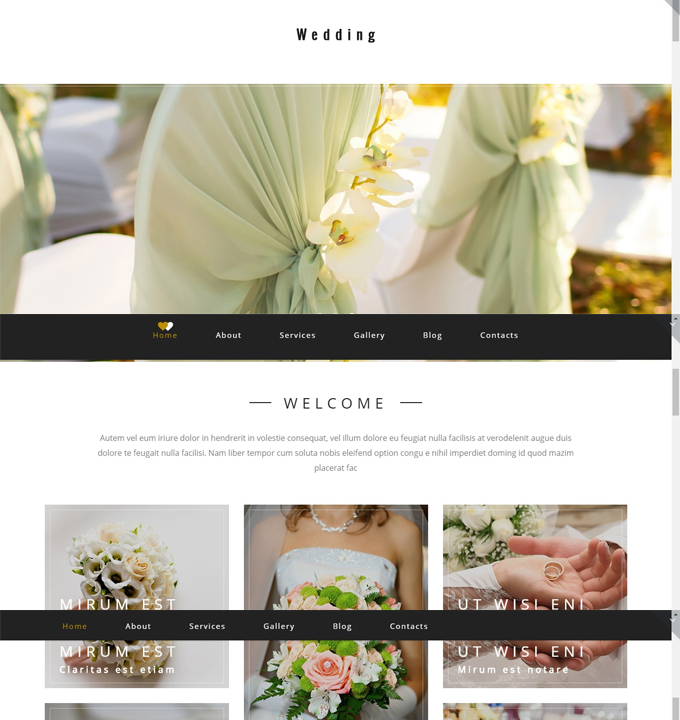 Bridal is a highly flexible and customizable premium WordPress wedding theme designed for couples, event planners, organizers and portfolios in mind. 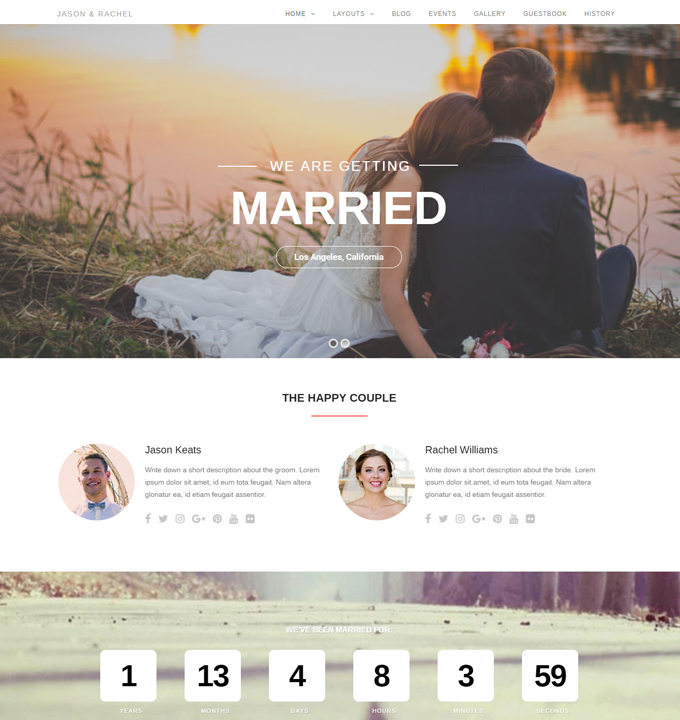 Perfect for blogs, personal websites and even photography websites dedicated to the matrimonial niche, this template is filled with tons of useful elements that may come in handy. It is responsive, retina-ready and cross-browser compatible. Furthermore, it comes with RTL language support, multi-store options, as well as powerful Admin options. The parallax effect and video background add more appeal to the outlook of the site. Not only this, but with easy colour scheme options, RSVP forms, powerful tools and more, this premium option offers more than you can think of! Composite Pages for easy usage. A vibrant, colourful and fun way to showcase your special day, Confetti is a brilliant concept brought together with the wedding niche in mind. 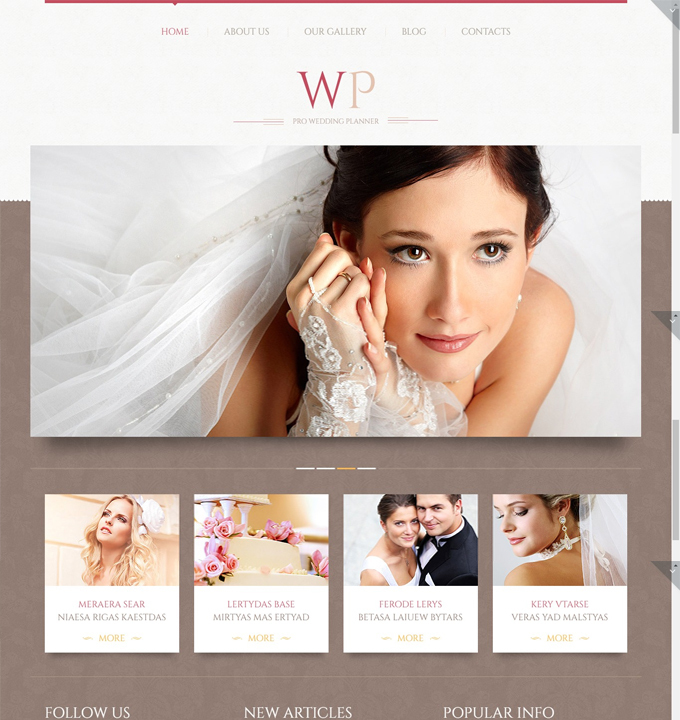 Perfect to be used as a premium WordPress wedding theme, this template is flexible and extensible. The layout is built to be responsive and retina-ready. Additionally, the excellent visuals are backed up by powerful editing and customizing tools and options. Furthermore, the easy to use Drag and Drop Page builder provides a user-friendly interface. Additionally, to add an extra appealing factor, it includes a functional Countdown timer and option for a calendar. Furthermore, you can even add Google Maps and display location and venue details. Testimonials and Guest information sections. Contact forms, and RSVP forms included. 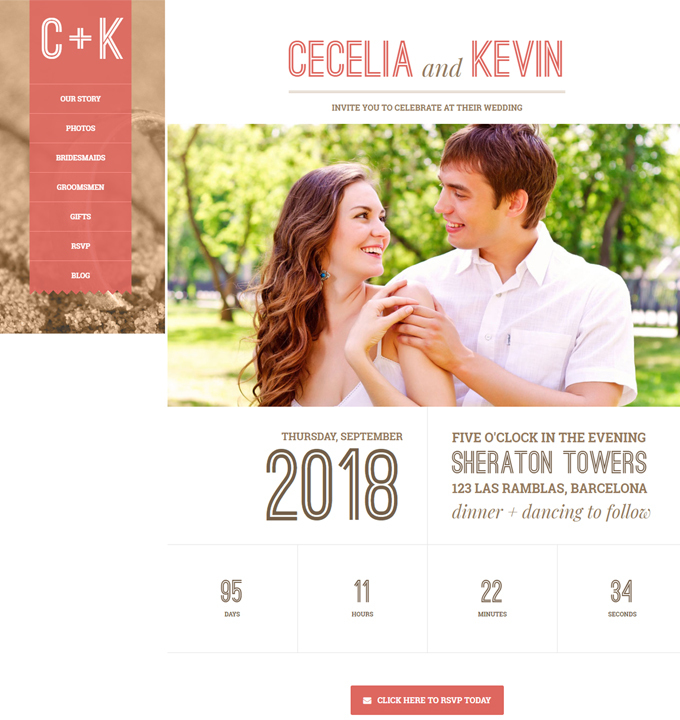 Bride and Groom information sections. Butterfly is a feminine, elegant and chic premium WordPress wedding theme built and designed especially for personal use. With an easy-to-use Drag and Drop Page builder and tons of customizing option, this theme ensures that everything is according to your preference. Futhermore, it supports video background and adds that extra appealing factor you are looking for. Completely responsive, retina-ready and stunning to look at, this theme also offers a range of useful elements that you can utilize. Additionally, each section for blog, gallery, testimonials, contact, venues and guests are professionally designed. Even the colour schemes and the typography matches the niche perfectly. So if you are looking for an easy way to start out, Butterfly is the way to go! Animated gradient and parallax effect. Translation and RTL language ready. HomePage variations to choose from. RSVP and Contact form included. Yet another brilliantly designed premium WordPress wedding theme, Aimer is a creative, modern and stylish theme. Complete with options for the countdown timer, Google Maps, RSVP forms, photo gallery, blog, contact forms and more, this template is the ideal choice. The layout structure is crafted with attention to the smallest of details so that you have a flawless interface to work with. Furthermore, it is completely responsive and features and excellent imagery. Even the elegant fonts and typography are used to enhance the overall outlook. Furthermore, with the advanced coding, this template offers smooth scrolling and parallax effect as well. Perfect for wedding websites of all niche, Aimer is certainly worthy of a mention here. Specific shortcodes to add features. Translation ready and RTL language friendly. Last but not the least, One Love is a clean, minimal and elegant option of you are searching for the perfect premium WordPress wedding theme. One of the best selling theme featuring a multi-purpose layout structure, it is certainly worth a try. Whether you want to start a blog, open a shop, start a portfolio or event website related to the niche, this flexible theme meets all the requirements. Additionally, completely responsive and retina-ready, it features an excellent visual, to say the least. What’s more is that you get access to the elegant countdown timer, stunning Sliders, creative photo galleries and engaging blog sections. RSVP and Contact forms included. Unlimited gallery and portfolio option. And this sums up our list today on the best Premium WordPress wedding themes out there. Whether you are planning to start a blog, share your wedding day in an appealing manner, promoting your business or simply starting a portfolio, we have covered all the niche above! Ideal for event planners, wedding managers, boutiques, florists, cake decorators, bridal wear rentals and even wedding photographers, we have mentioned themes that are suitable for them all. So what are you waiting for? Pick out the one that best peaks your interest and start your online journey today. We hope by now you have found what you are looking for and we hope you liked this article today. Additionally, feel free to let us know what you think about our post below in the comment section! Don’t forget to check out more of our theme listing to help you find exactly what you are looking for! 20 Best Multipurpose WordPress themes For All Website Niche! 30 Best Premium WordPress Business Themes For Agencies, Companies and More! 15 Best WordPress Elementor Themes For Efficient Page Building! ← 20 Best Free MultiPurpose WordPress Themes For Websites Of All Niche! Nice list Sam. Although my theme of choice for wedding sites is Moments, some of those you have listed looks pretty good as well. Any reason why some of those are more expensive? Some of them are 79$ which is almost 50% more than others. Glad you found the post helpful. Well, the pricing usually depends upon the features included and varies from company to company. While there are cheaper ones we have included, the expensive ones tend to provide more features, options for customizations and so on. 🙂 And for our listing, we wanted to cover the themes of all price levels so that you have the option to opt for the one you prefer. 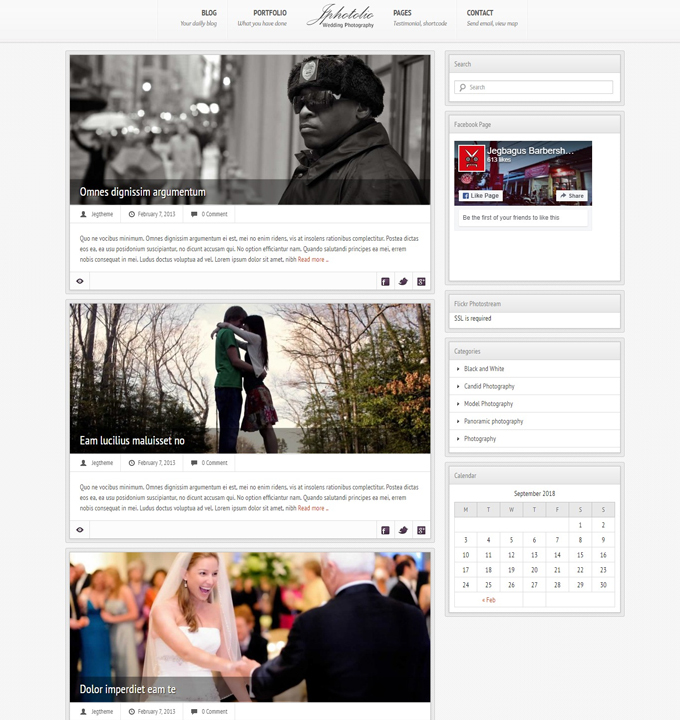 Nice to see Sam, those beautiful wedding WordPress Themes… They are really impressive!